Our scheduled time is Saturday, November 11 at 1pm. 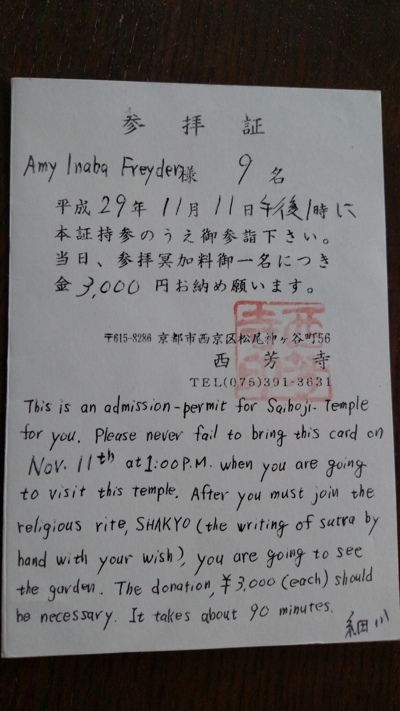 My confirmation postcard says, “Please never fail to bring this card on Nov. 11th at 1:00 pm when you are going to visit this temple.” My Japanese friend and I had a good a laugh over this wording. I found out about Kokedera while surfing the internet. 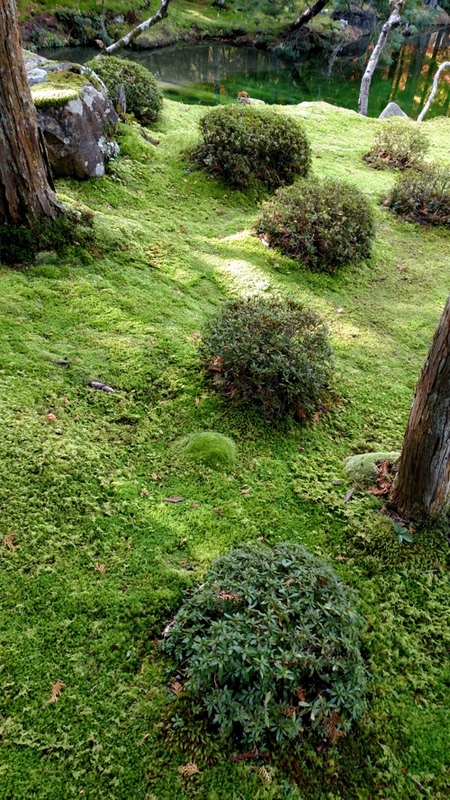 The real name of this temple is Saiho-ji but it is also known as Kokedera which translates koke = moss and dera = temple, so it’s the moss temple. 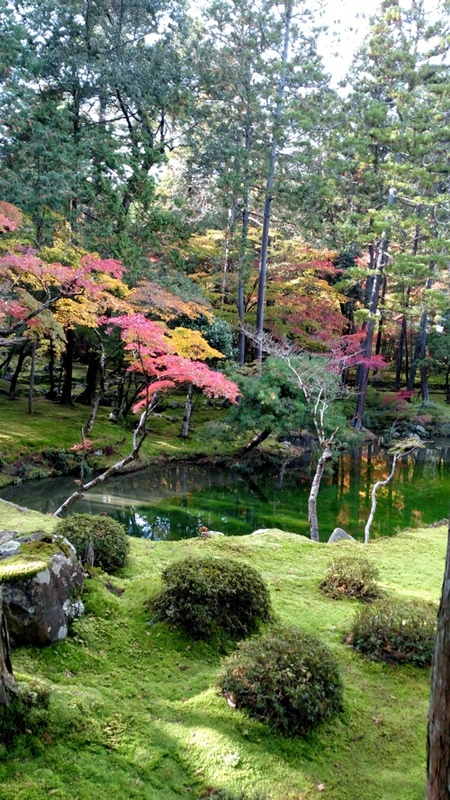 It is located in Western Kyoto, not far from the popular town Arashiyama. 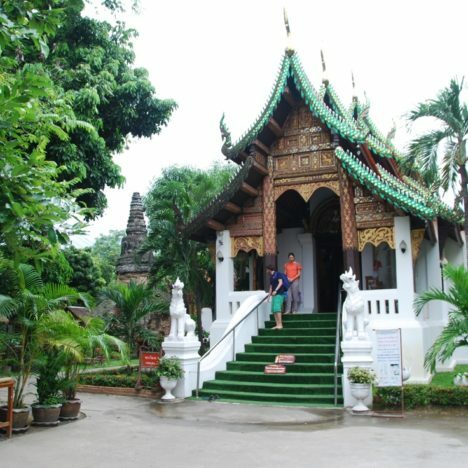 This temple is a bit off the beaten path, not because it is not known, but because it takes some effort to visit and I think people don’t want to bother with the extra effort. First of all you have to apply by postcard in order to gain admittance. By SNAIL MAIL. The directions say you must mail a two-way postcard (like a self-addressed stamped envelope in the US, but a postcard version) known in Japanese as “ofuku hagaki,” a reply-paid postcard. I went to the post office to purchase this. 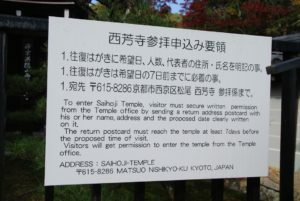 On one side of the postcard you write to the temple and include your name, contact information, date you want to visit, and how many people. Then on the other half you write your address for the temple’s reply. The temple suggests that you include a few dates that you can go and also send it at least 7 days in advance of your date. I asked some of our Japanese friends if they’d like to join us. This meant all of us getting our calendars out and finding a mutually available date. It’s a nearly impossible feat. We came up with Saturday, November 11. Since we could only find one date I sent the postcard a month in advance hoping we would get this date. I crossed my fingers. When John and I went to Tofukuji Temple in Kyoto I mailed it from there, because I hoped it would give us extra good luck for getting our date. After exactly one week the postcard came back. We were approved for November 11! We met our friends at 12:45 pm outside the gates of the temple. I already knew from reading stories on the internet that after we arrived we would have to pay a 3,000 yen per person entrance fee. That’s roughly $30 per person! Under 12 years old is free so Avalon was free, phew. Not only do they limit attendance this way, but only the truly committed come. 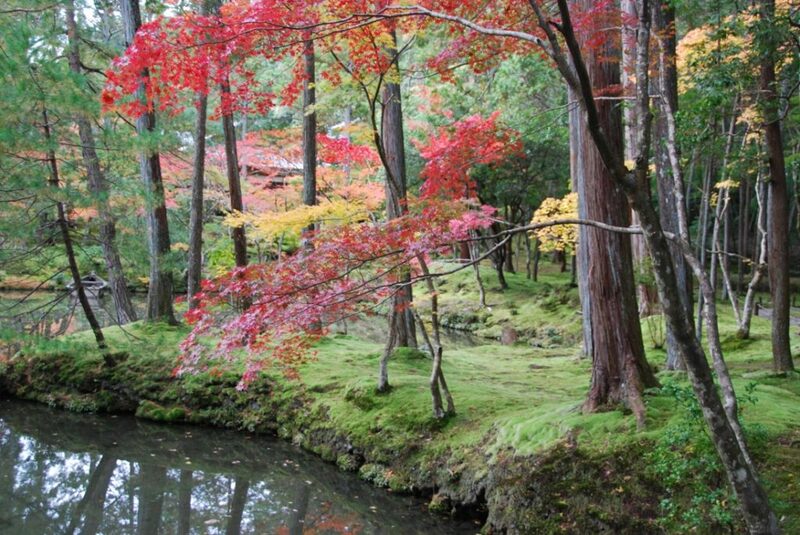 For being the height of koyo (the Japanese word for autumn leaves changing color) season, the crowd was very minimal. After paying 12,000 yen we went inside the temple to sit on the floor at impossibly small desks with only enough room for a midget’s legs. Since none of us are midgets it was really uncomfortable. 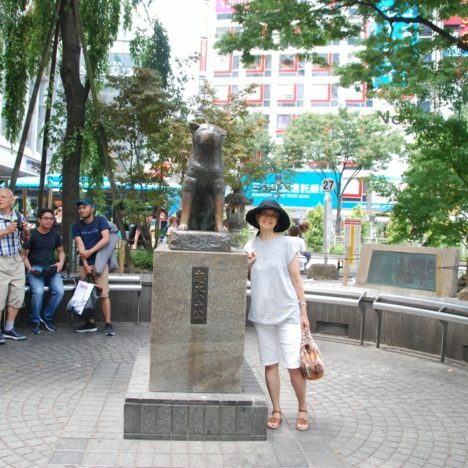 Even my Japanese friend kept shifting around and changing her position, saying her knees hurt and then her hips hurt. Halyard also couldn’t sit still. I tried to sit “Indian style” but it was too small of a space. 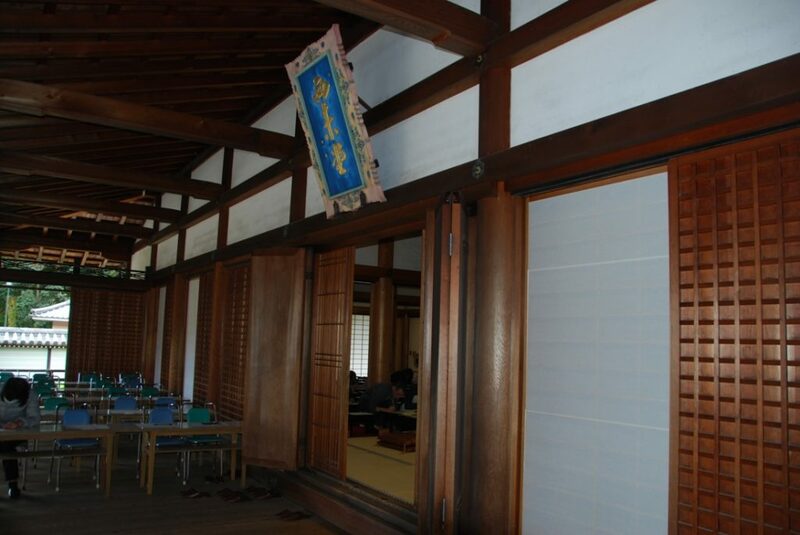 Anyway, we sat there participating in the Buddhist practice of copying sutras called shakyo. 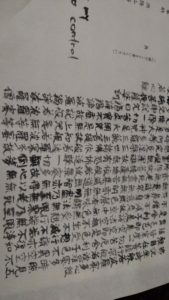 We traced Japanese characters on a paper using a calligraphy brush and black ink that we dipped the brush into. 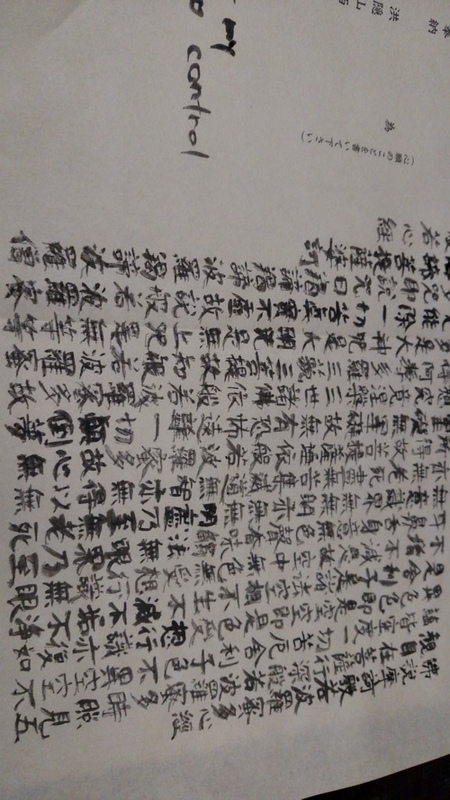 A friend explained it was the “Heart Sutra.” I finished the whole thing! But I had read online that if you don’t want to finish, or can’t finish because your knees, legs hips or feet hurt too much(! ), you don’t have to. They just ask that you write a wish on the left side of the paper before you turn it in and the Buddhist monks will pray for your wish. For my wish I wrote, “I wish my president would control himself better.” I didn’t say which president I was referring to, but it could probably apply to many presidents anyway. 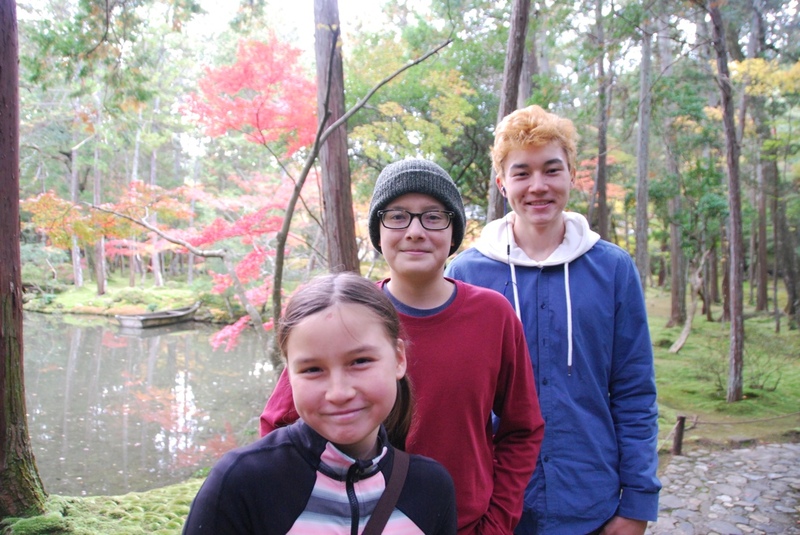 After we finished the shakyo writing we turned it in and walked out to the gardens. 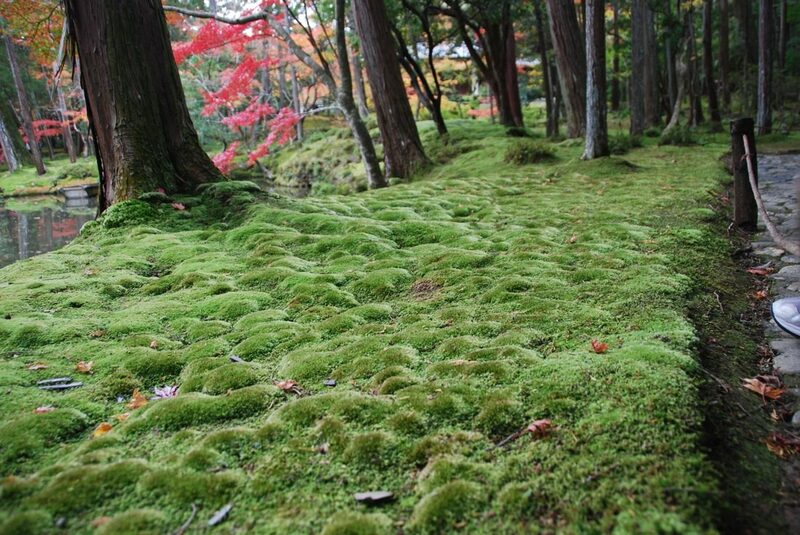 This moss looks like a plush green carpet. It felt so good, too. A little squishy. But it was soft and springy. 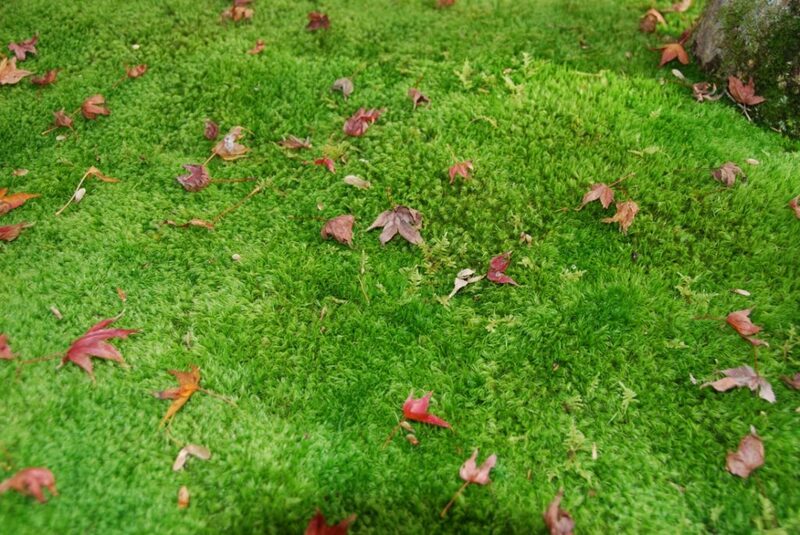 We couldn’t walk on it but when I put my hands on it the moss felt awesome. 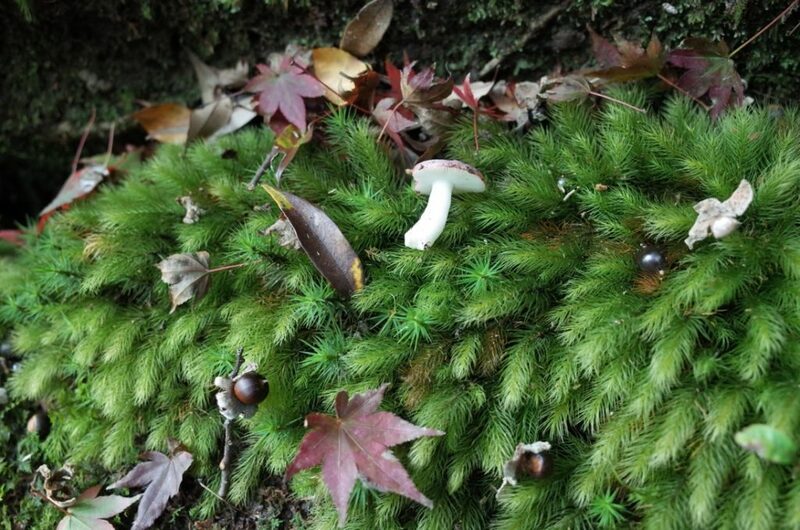 This next photo of moss and mushrooms was taken by our friend Jay. It looks like a Christmas tree with nature’s decorations. I love those cute smiles! Happy kids make me happy. This next photo is us with our good friends Jay and Mari. 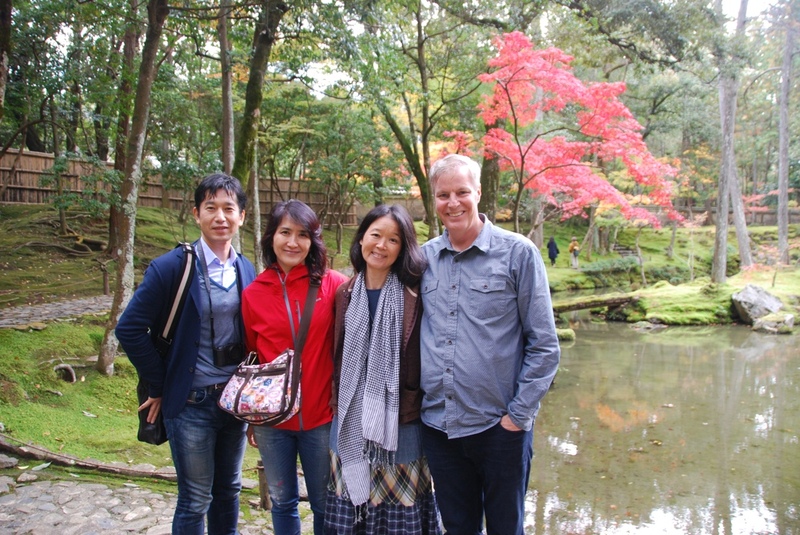 They are some of the most wonderful people we have met in Japan. Jay went to grad school at Cambridge U and Mari went to grad school at Oxford U. They were married at the time but accepted to different universities so they had to separate for a while. They both speak excellent English. We met them through Halyard and Avalon’s brief stint in water polo. Jay played water polo in high school and both of his boys now play. Even though Halyard and Avalon didn’t keep up water polo, we still kept in touch with them. 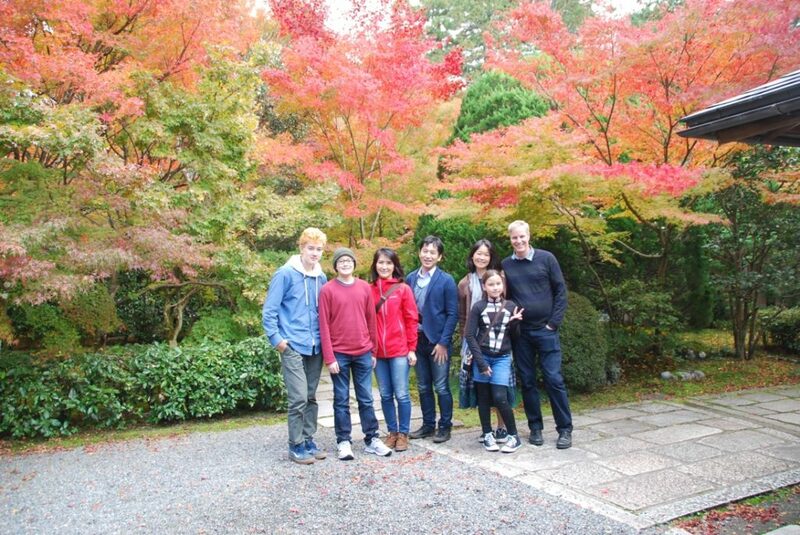 They are some of our best Japanese friends here. 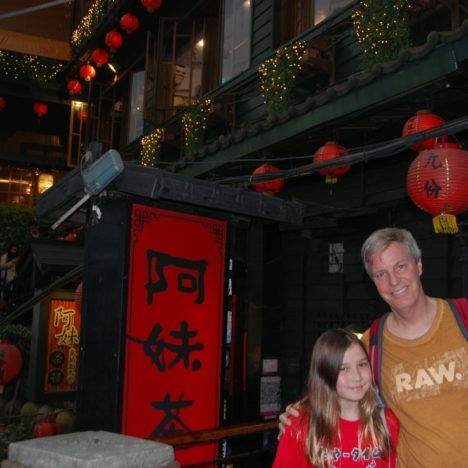 I meet Mari every week to help her with her English, even though I think her English is already terrific. Our friends have a very global perspective of the world which is very refreshing here. Both of them come from altruistic families who have a wide worldview perspective concerning business, charity, relationships, language and education. 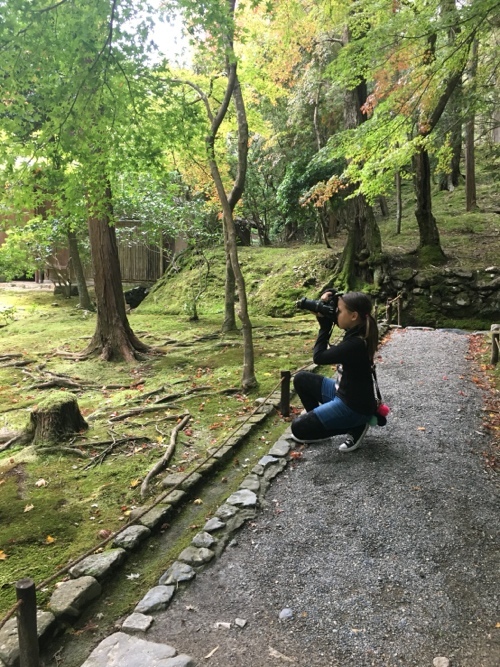 It’s hard to explain, but typical Japanese people tend to hold tightly to tradition and routine and it’s hard to break out of this mold, especially because Japan is such a homogeneous island nation. It’s like thinking one way of doing things is best because you don’t know any other way to do it. 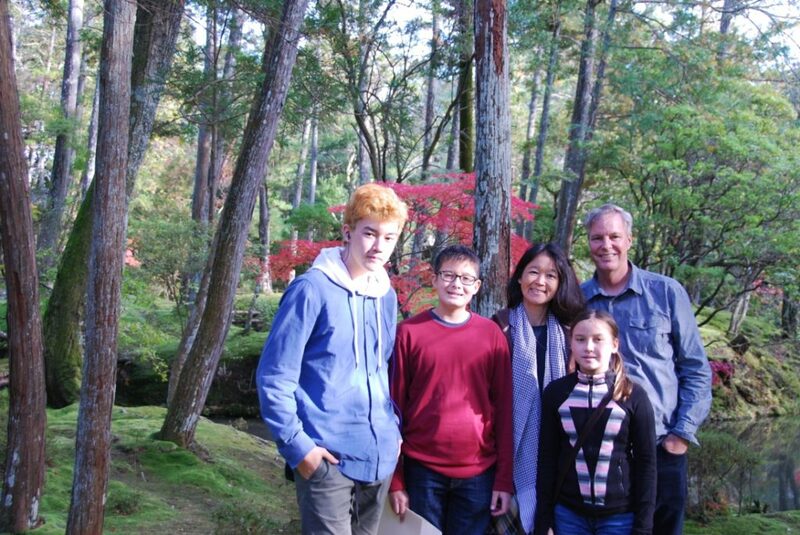 I think Jay and Mari and their families are inspirational because they have a diverse outlook on life in Japan and the rest of the world. Even though it’s a bit of a process to go to Kokedera I highly recommend it. 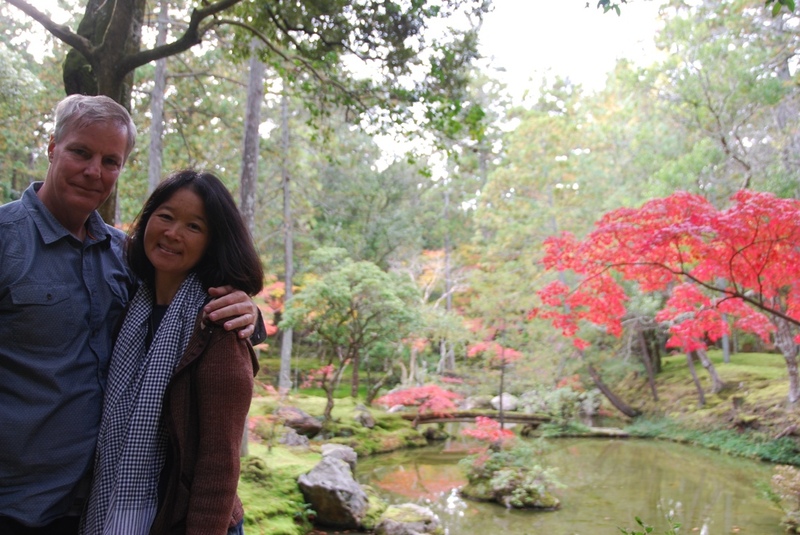 It was one of the most beautiful temple gardens that we have ever been to. 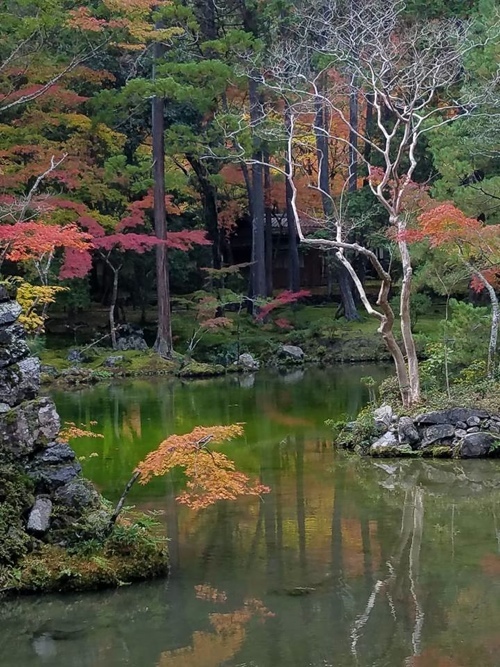 The 3,000 yen per person fee is high but it really serves to reduce the crowds and in Kyoto that can make for a serene and peaceful experience.